Sorry I missed posting anything yesterday. I was caught up in the holiday: doing some Christmas shopping, going to parties, and anticipating a bit of vacation. Today A.J. 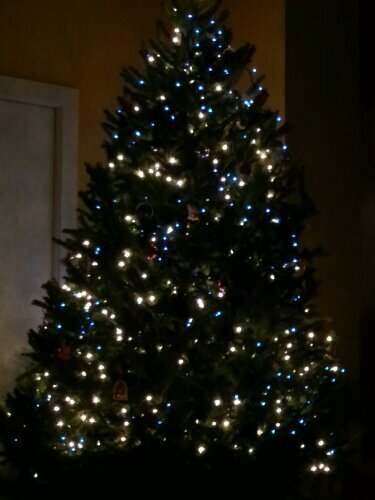 and I got our tree, and we’ve just finished decorating it. Most years, we walk the three or four blocks to our local garden shop / Christmas tree place, pick the cutest, littlest tree left on the lot, and carry it home. And we usually do this on Christmas Eve. But we drove by there this morning, and all their trees were gone. So we ended up having to drive to the next nearest tree lot to bring home a BIG tree instead. I’ll be taking a break from posting for the next couple of days. I’m intending to post a few things during the week, but I’ll actually be on vacation … so we’ll see. If you celebrate Christmas, I hope yours is merry! Enjoy your holliday, have a good time! !